I seem to lack the ability to grow tomatoes. I blame it on our yard. The front yard only gets the hottest, harshest sun of the day, and the back yard is too shaded. I have a few cherry tomato plants, but they’re only doing ok. They're certainly not producing record numbers of cherry tomatoes. I’ve accepted that I need to leave serious tomato growing to the pros. One of our local pros is Johnson’s Backyard Garden, and they’ve had an incredible tomato harvest this year. In fact, they have a bulk tomato sale that’s still in effect, and that’s how I came to have ten pounds of San Marzano’s. I set aside a few of them for oven roasting, and the rest were plunged into boiling water, skinned, and then seeded. By the end of the ten pounds, and really ten pounds isn’t even that much, it seemed like a lot of work, but when I tasted the tomatoes it was completely worth it. My first thought of how to use some of these tomatoes was that classic sauce I’ve heard so much about from Marcella Hazan. In Essentials of Classic Italian Cooking , she included what she calls “the simplest of all sauces to make.” She also mentions “none has a purer, more irresistibly sweet tomato taste.” She’s right about that. I tasted the sauce so many times as it cooked I risked not having any left to serve with pasta. This is her famous tomato sauce with onion and butter. There are exactly three ingredients plus salt and pepper, and it is a perfect sauce. Obviously, the better the tomatoes, the better the sauce, and I was starting with those fabulous, fresh San Marzanos. As I said, I had peeled and seeded the tomatoes, and then I roughly chopped them. Two pounds were needed for one recipe of this sauce. The tomatoes went into a sauce pan with one onion that had been peeled and cut in half. Five tablespoons of butter was added, and then the sauce cooked. Occasional stirring helped break down the tomatoes, the liquid reduced, the sauce thickened, the butter melted, the onion added its flavor, and the simplest, most delicious sauce came to be. The onion was removed and seasoning was adjusted before the sauce was used. Marcella recommends this sauce for gnocchi or penne or rigatoni. I chose rigatoni which was boiled and then tossed with the sauce. On the plate, I added shards of parmigiano reggiano and ribbons of basil. This sauce could be made with canned tomatoes, but the flavor of fresh tomatoes is so much better. The butter makes them even sweeter, and the onion rounds out the savoriness. I found it impossible to not taste the sauce each time I stopped by the pan to stir it, and once tossed with pasta, the bright, freshness of it was unbelievable. And, the very good news is that I have more of those peeled and seeded tomatoes sitting in my freezer just waiting to be turned into sauce. Hilarious Lisa - I'm making this tonight! My neighbor is going to help me make fresh pasta, again. I'm not great at it and I figured I wanted a super simple sauce to highlight the fresh pasta. We don't ever get good tomatoes up here so it will be canned. Glad to know it is as good as everyone says it is. This is exactly how I make tomato sauce! In fact, I made some the other night for stuffed shells. I don't think there's anything better than pasta, tomatoes, butter, onion and a bit of Parmigiano. Wow, 10lbs of san marzano's! Can't think of a better use for them. Am *so* making this tonight...definitely kismit. Gracias! Thank you Marcella Hazan. I amde this sauce just yesterday after so many accolades from friends.It is probably the best and simplest sauce ever! The winter tomatoes we have now wouldn't do this sauce justice but I've bookmarked it for the first tomatoes of summer. It looks delicious! Sounds and looks like a terrific sauce! Kudos to you for taking advantage of the tomato sale. I'm too lazy to put up tomatoes in bulk but I'm sure I'll be regretting it this winter. Also, I can't seem to grow tomatos either. This year I went in with my neighbor and we planted a slew of transplants in her backyard, which gets plenty of sun. Other than a yellow vareity of cherry tomatos, we haven't had much luck either. Deceivingly simple recipe with roll your eyes flavors. It all comes down to the tomatoes, doesn't it? Simply delicious! Summer time is perfect for fresh sauce like this. I'll have to make with such great reviews. 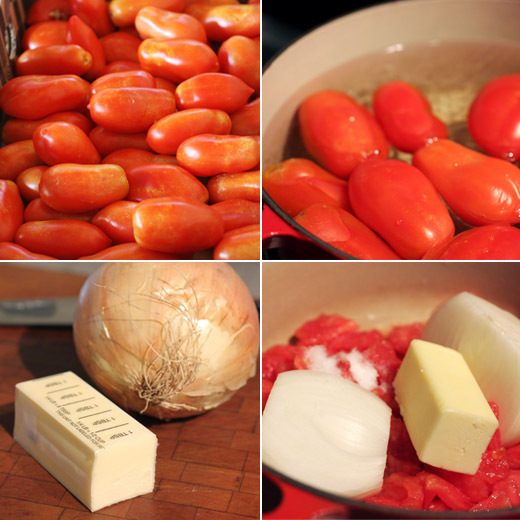 Growing up in an Italian-American family, we never used butter in tomato sauce. We hardly used it on toast! But, as a food blogger, I've become increasingly aware of the use of butter in pasta sauce. I must break out of the family mode and try it. TEN POUNDS OF SAN MARZANOS!?!??!?!?!? Lucky girl. I've heard such good things about this sauce before! It's definitely a need-to-try. Yummmm. Nothing quite like San Marzanos. You are definitely not alone in the tomato department... I tried to grow them last summer (inside my apartment...) and all I ended up with were fruit flies! But I so love them, and will definitely have to pick some up to make this delicious sounding dish! 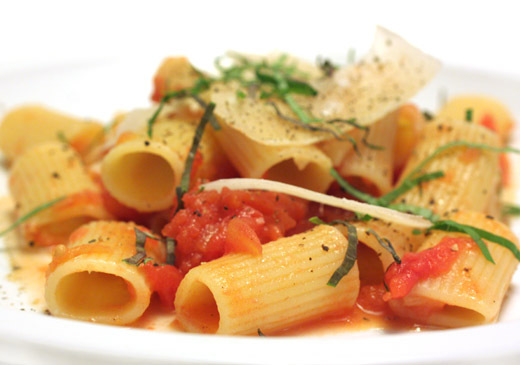 A simple yet very flavourful pasta dish. I can't grow anything! Even the herbs on the pot I have next to the kitchen window are dying :( hehe. I love this pasta dish! Isn't that weird how it works? I'm pretty good at growing tomatoes, but I'm terrible at peppers, zucchini, and even radishes to be honest. I can't explain why. i love how fresh this looks and must taste. 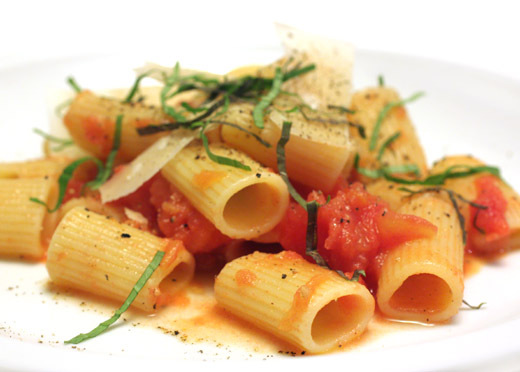 pasta dishes aren't really my favorite, but this is undeniably appealing! I LOVE that book and I adore this recipe. I've been meaning to make it forever! Thanks for the reminder, Lisa. My fingers are crossed for my heirlooms this year. Flowers yes, tomatoes, no can do! Yum, this sounds amazing, I've made a version of this but I used olive oil instead of butter, I'll be switching for the next round.